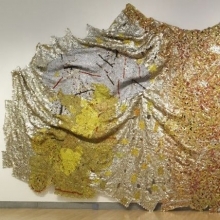 Reading French philosopher Simone Weil’s 1947 book Gravity and Grace inspired Anatsui to explore the concepts of what he calls “the material and the spiritual, of heaven and earth, of the physical and the ethereal” by using a limited, contrasting color palette, as typified in this work, among his largest. 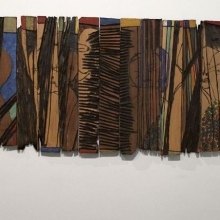 The seriousness of Anatsui’s project reveals itself in the limits to which he stretches his materials and process, while the title and form evoke a poetic interest in transcendence and connection. 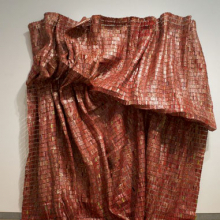 Like all of Anatsui’s works, Drainpipe is tailored to the space it occupies each time it is installed. 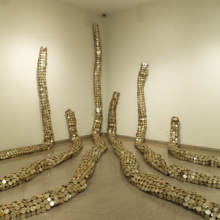 The basic unit for this piece is sheets of linked milk tin lids. The sheets are rolled up and placed in line to create long cylindrical forms. The variety of pipelike forms that could be assembled with this single unit suggests the potential of the new medium. 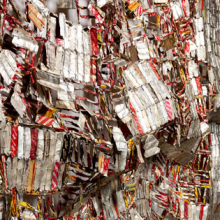 Red Block reveals El Anatsui testing the aesthetic limits of his invented medium. He explores the monumentality and meditativeness of a single color—suggestive, perhaps, of paintings by Mark Rothko or Gerhard Richter—yet at the same time deliberately introduces subtle variations, activating an otherwise uniform surface with small, intentional surprises that draw the viewer closer. 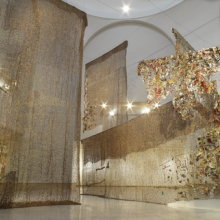 Included in the exhibition are twelve recent monumental wall and floor sculptures, widely considered to represent the apex of Anatsui’s career. 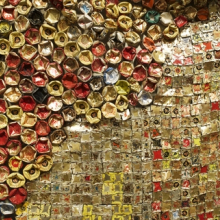 The metal wall works, created with bottle caps from a distillery in Nsukka, are pieced together to form colorful, textured hangings that take on radically new shapes with each installation. 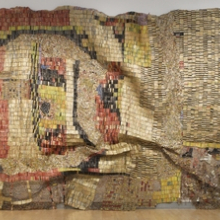 Anatsui is captivated by his materials’ history of use, reflecting his own nomadic background. 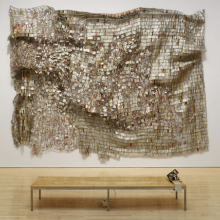 Gravity and Grace responds to a long history of innovations in abstract art and performance, building upon cross-cultural exchange among Africa, Europe, and the Americas and presenting works in a wholly new, African medium. 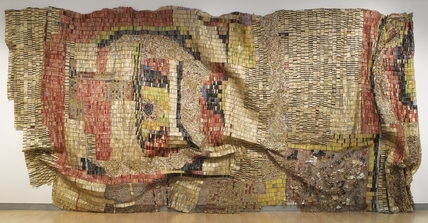 Gravity and Grace: Monumental Works by El Anatsui is organized by the Akron Art Museum and made possible by a major grant from the John S. and James L. Knight Foundation. The Brooklyn presentation is organized by Kevin Dumouchelle, Associate Curator of the Arts of Africa and the Pacific Islands, Brooklyn Museum. Generous support for this exhibition has been provided by Christie’s and The Broad Art Foundation, Santa Monica.